Writing the perfect song is a difficult task. What is “perfect”, anyway? What is it that the most popular songs all have in common? If you’re hoping to write the next big hit, you’ve come to the right place. The best songs in history have incorporated lyrics that uses clever rhyming schemes and syllabic patterns, a story-like progression, personal but relatable topics, and a catchy hook. 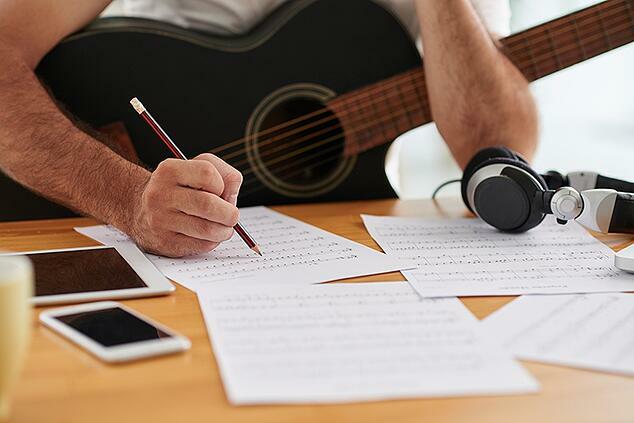 Writing the next big hit can seem impossible, but there are a few tricks you can use to increase your chances of success. These lyrics rhyme the words “lose” and “blues” together, but refrain from rhyming any words together in the next two lines. The use of rhyming should be a strategic way to draw attention to certain words, rather than used simply for the sake of rhyming. The combination of the strategic rhyming scheme, catchy melody, and raw talent of the members of Journey has made “Don’t Stop Believin’” a classic few will forget. Rather than singing about your recent trip to France and then jumping to an unrelated topic, such as your childhood friend, try sticking to the same idea throughout the song. This will allow the song to resonate with your listeners more easily. So many songs on the radio feel like they’ve been created by a machine simply to generate an income. If you’re a true songwriter, you know that music is about so much more than that. While tuning into recent trends and incorporating them into your songs will most likely help you gain some extra popularity, being disingenuous with your lyrics will set you up for failure. We all know how hard it is too warm up to someone we feel is being untruthful or two-faced. Likewise, your listeners will have a hard time warming up to your song if they don’t feel the lyrics are a reflection of your true personality. When you’re not a romantic, when you’re not political, and so on, do not try to sound like one. Disingenuous lyrics very easily and quickly will sound like that, and that’s a fantastic way to lose your audience. Regardless of your song’s theme or idea, your lyrics must in some way be connected with you if you want them to stand out and come across as genuine. If you don’t, your lyrics will lack conviction which will make them feel stale. The second and third lines in this song both use a total of twelve syllables each. The song wouldn’t have the same momentum if the pattern of twelve syllables was broken between lines two and three. In addition to the number of syllables, the last few words of these lines alternate between stressed and unstressed syllables in the same pattern. “Shrine of your lies” follows a stressed, unstressed, unstressed, stressed pattern, which you can see from the bolded words. Similarly, “sharpen your knife” follows the same rhythmic pattern. This creates coherence in the lyrics that wouldn’t be evident if you use different numbers and patterns of syllables in every line of your song. Every popular song needs a hook. Not only does a song need to have a hook, a good song needs to place that hook in a strategic spot. Just like a commercial you’d see on television, the hook should be at the beginning. Similar to how colorful ads are used to catch a viewer’s eye, catchy melodies are used to grab hold of our ears. Once you’ve established your melody, you’ll need to make sure the content of what you’re saying also acts as a hook. If you’re writing a love song and you use a cliche statement involving “your heart” and how hard it is to be “apart”, you won’t come across as the cutting-edge artist you’re hoping to be. Remember not to rush the development of your hook, as it will be what draws your listeners in more than anything else.